I'm on my way out of town tomorrow for some much-needed vacation with the family, but I wanted to share these two books before I left. Truth be told, each is strong and deep enough to warrant its own blog post, but with time growing short and the packing list growing long, I will lean into the spirit of #WorldsOkayest and share briefly about both. 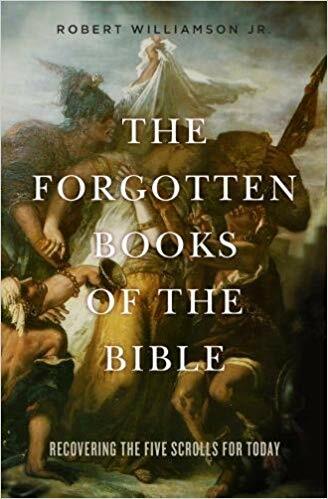 First is The Forgotten Books of the Bible: Recovering the Five Scrolls for Today, by Robert Williamson. Bobby is a seminary colleague, and now a fancy Bible professor, but he writes beautifully for a wide audience, which this book deserves. The book considers five biblical texts that are often considered also-rans in the Christian tradition, which is a shame, because they are so rich and, well, just plain fascinating: Song of Songs, Ruth, Lamentations, Ecclesiastes, and Esther. I have a passing knowledge of two of these, Ruth and Esther, only because I've preached and taught on them from time to time. The other three were largely new to me as objects of study, and Bobby is a great guide--clear and wise... and funny! "Naomi and Elimelech should have known better than to name their sons Mahlon, which hints at the Hebrew word for 'sickness,' and Chilion, which resembles the word for 'annihilation'. It’s like naming your kids Sicky Sickerson and Deathy McDeathface. Don’t do it. They will die." Bobby looks at these texts as conversation partners with contemporary issues of the day, such as Song of Songs and human sexuality/#MeToo, and Ruth and immigration. He ably avoids "ripped from the headlines" syndrome that can plague many books that try to tackle current events, though. He pulls this off because the stories resonate across the ages, but also because the dynamics underlying so many of our current issues are also timeless, and he treats them with wisdom and care. In addition to being a scholar, Bobby also pastors Mercy Church, a community in Little Rock that ministers with and to people experiencing homelessness and other challenges. This gives him an important and needed vantage point from which to write and reflect. This book is released TODAY, so if you think you'll buy it anyway, do a good deed for a writer's first book and get it today; it will boost his numbers and make him so happy. (Voice of experience.) This would be a great group study, and I hear a study guide is forthcoming. The second book is Anna Carter Florence's Rehearsing Scripture: Discovering God’s Word in Community, newly released last month. Anna was a seminary professor who continues to be a mentor and light to me, and to many. One of my regrets is that I never took her "theatre in the text" course, but a lot of it is here, I suspect. Anna considers the congregation as a repertory community, similar to repertory theatre companies, who work together as a team over a long period of time, poring over texts and bringing them to life. The book makes the argument for engaging scripture as a script--not for the purpose of dramatizing it, though you could; this is a process of formation, of going deeper than head knowledge into the realm of embodied experience. In addition to sharing why this work is important, Anna also offers a number of tools for encountering scripture together. I love her approach of considering the verbs first--who is doing what action, and in what order does this action take place? Which verbs catch our eye, and which ones do we miss on first reading? Why might the author have chosen this action word and not another? What an enlivening place to start! Here is my endorsement of this book: I love what I do in my current ministry of writing, speaking and coaching. It's a joy to visit so many communities and be with them for a short period of time, engaging them in a deep, albeit temporary way. I do not feel called back into the pastorate. But as I read this book, I found myself longing for that role again, because it's such a gift to let this work unfold, in relationship and over time; to engage a community as they play with scripture in a spirit of exploration, curiosity and play. That's what this book does: it invites you to engage the text, not just with your head, but with your heart and body as well. I'm back from a wonderful time of vacation with the family in Massanutten. We found a sweet little farm house to rent that had comfy rooms and no wifi. Perfect. We lazed about and did the indoor water park. By the way, there are two kinds of people in the world: people who shoot complete strangers with water cannons, and non-a**h***s.
We also enrolled the kids in a morning of ski school, which (after seeing James zip down the mountain) I'd call frighteningly effective. Things Not Seen is a radio show devoted to "Conversations about Faith and Culture." Last month I had a lovely conversation with David Dault about Sabbath, which you can listen to here. This coming year I'll be an occasional contributor to The Hardest Question, which is a weekly resource on the Revised Common Lectionary. I've got the texts for this Sunday, and wrote about the Gospel and the Old Testament texts. Landon Whitsitt compiled many sermons and responses to the Newtown tragedy into an e-book, called A Good Word. I'm in there along with a huge number of others. What an undertaking! And finally, my book is listed on Ministry Matters as a "must read" for 2013. So much to love about this. The guide had fallen in the 400 which cost them the victory, and you can see the joy here! Also love that this year, guides are also receiving medals. I have joked about there needing to be a system that penalizes you financially for not keeping your fitness goals, and here it is, from the good people at RunKeeper! Earn real money for making your workouts — paid for by those who missed theirs! With cash on the line, you'll find it easier than ever to get to the gym and see real results. What [researchers] found was that those adults who had been the least fit at the time of their middle-age checkup also were the most likely to have developed any of eight serious or chronic conditions early in the aging process. These include heart disease, diabetes, Alzheimer’s, and colon or lung cancer. What if those middle-fit people had been fit their whole lives and it was their youthful fitness that gave them the real benefit? I'm going to keep being fit, just in case the article is right, and because nobody has invented a time machine yet. And also because I feel much, much better in every measurable way. Already shared this early in the week but it bears repeating. It will make you feel good. What pleasures would you add? The pleasure of from Vitùc on Vimeo. It may not be immediately obvious, but when people offer these phases, these stock answers, it sends a clear and demoralizing message: "I don't take your struggles seriously, and I'm not prepared to muster the theological depth to share them with you." This might be a harsh assessment, but this is a great problem, and worthy of such consideration. If you use these Christian platitudes, these unholy clichés in your care for your brothers and sisters, I urge you to carefully consider dropping them. If you find your friends using them on you, forgive them, then challenge them. Muster some courage and tell them you find those words to be theologically empty and pastorally cold. It's the only way we're going to grow and learn to struggle together. I think there can be another, more benign message in these platitudes: I love you so much, and am so hurt that you are hurting, that I will seek to reduce the hurt any way I can. It's just that platitudes aren't effective in reducing the hurt and in fact can make things worse. Not really new stuff here, but it's good to be reminded (and help people who didn't go to seminary to understand) that the New Testament we have is organized by genre rather than chronologically. And Paul's letters were written earliest, before the gospels. Beginning with seven of Paul's letters illustrates that there were vibrant Christian communities spread throughout the Roman Empire before there were written Gospels. His letters provide a "window" into the life of very early Christian communities. Placing the Gospels after Paul makes it clear that as written documents they are not the source of early Christianity but its product. The Gospel -- the good news -- of and about Jesus existed before the Gospels. They are the products of early Christian communities several decades after Jesus' historical life and tell us how those communities saw his significance in their historical context. Give us, oh Lord, humility to listen to our sisters and brothers across the political spectrum, because your kingdom is not divided into Red States and Blue States. Equip us with moral imagination to have real discourse. Knit us, oh God, as one country even as we wrestle over the complexity of how we ought to live and govern. Give us gratitude for our right to dissent and disagree. For we know that we are bound up in one another and have been given the tremendous opportunity to extend humanity and grace when others voice their deeply held convictions even when they differ from our own. So much to love here. No amount of pastoral eloquence, organization, insightfulness, amicability, or charisma will take your congregation back to back to its glory days. With [the policy], NPR commits itself as an organization to avoid the worst excesses of “he said, she said” journalism. It says to itself that a report characterized by false balance is a false report. It introduces a new and potentially powerful concept of fairness: being “fair to the truth,” which as we know is not always evenly distributed among the sides in a public dispute. Maintaining the “appearance of balance” isn’t good enough, NPR says. “If the balance of evidence in a matter of controversy weighs heavily on one side…” we have to say so. When we are spun, we don’t just report it. “We tell our audience…” This is spin! Each thing I do I rush through so I can do something else. In such a way do the days pass— a blend of stock car racing and the never ending building of a gothic cathedral. Through the windows of my speeding car, I see all that I love falling away: books unread, jokes untold, landscapes unvisited. And why? More at the link. Powerful. Gordon has been blogging each day during Lent---good, heart-wrenching stuff from his vantage point as a former pastor. His mini-essays have become daily reading for me, since the book our congregation is using was written by yours truly. I don't have much to say to God these days. No requests. No praises. No promises that I'll be a better boy. It's not that I have anything against talking to God. It's just that I did so much of that for such a long time. I grew up in the Baptist church where all we did was yammer on about this and that. Then I ended up being a preacher for twenty years. I've done my share of talking is what I'm saying. I'm kind of in a season of quiet these days. I like to say I'm listening to God, but I've never heard God say anything. I get messages now and then but they always come through a side channel. What I do these days when I pray is get very quiet. You have to work hard at real quiet. It takes me about twenty minutes to settle in. The Quakers taught me that. At first I thought the Quaker meetings seemed kind of long. Later I found myself arriving early so I could get calm ahead of time because I was losing a third of the hour to the fidgets. Pagels ... shows that Revelation, far from being meant as a hallucinatory prophecy, is actually a coded account of events that were happening at the time John was writing. It’s essentially a political cartoon about the crisis in the Jesus movement in the late first century, with Jerusalem fallen and the Temple destroyed and the Saviour, despite his promises, still not back. All the imagery of the rapt and the raptured and the rest that the “Left Behind” books have made a staple for fundamentalist Christians represents contemporary people and events, and was well understood in those terms by the original audience. Revelation is really like one of those old-fashioned editorial drawings where Labor is a pair of overalls and a hammer, and Capital a bag of money in a tuxedo and top hat, and Economic Justice a woman in flowing robes, with a worried look. What’s more original to Pagels’s book is the view that Revelation is essentially an anti-Christian polemic. It will be an online church. It's an intriguing prototype (to use language we heard at NEXT) and I think I'd sum up my opinion of this with one of the comments: "Please push the envelope on this, while regarding the en-fleshed experience of the gospel as essential." Politicians would like us to believe that all this money doesn’t matter in a deeper sense—that what matters is ideas, skills, and leadership ability. Aside from a little extra business savvy, they’re regular people just like the rest of us: They just happen to have more money. But is that true? In fact, a number of new studies suggest that, in certain key ways, people with that much money are not like the rest of us at all. As a mounting body of research is showing, wealth can actually change how we think and behave—and not for the better. Rich people have a harder time connecting with others, showing less empathy to the extent of dehumanizing those who are different from them. They are less charitable and generous. They are less likely to help someone in trouble. And they are more likely to defend an unfair status quo. If you think you’d behave differently in their place, meanwhile, you’re probably wrong: These aren’t just inherited traits, but developed ones. Money, in other words, changes who you are. Read the studies for yourself and tell me what you think. True confession time... I've been working on the stuff in this sermon for since 2002. I've preached versions of it in three different pulpits. It's a story I love and a text that won't let me go. Here's the latest go-round. I remember the year the movie Field of Dreams came out, I was telling some friends how much I enjoyed it because it was about the consequences of taking a leap of faith. “What are you talking about?” one friend asked. “That movie is about the relationship between a father and son.” “No way,” said another, “that movie is about the enduring power of baseball!” And so forth. And of course, the movie is about all those things. And more. We all think we know what this story is about, right? Original sin? Disobedience? The “fall” of humanity? That old tune that many of us have heard so much it’s ho-hum second nature? Hold on to your hats, folks! I’d like to offer a different interpretation of this story. Why? Because we can… because before this was part of a theological debate about sin and salvation, it was a story. Before the theologians made the serpent the embodiment of Satan, he was… a serpent. A character in the story. And stories can contain more than one meaning. It’s just that I’ve been hearing sermons on Adam and Eve my whole life, and have felt that the original sin stuff, the “fall” stuff, may be good doctrine, but just a little bit ill-fitting to this story… or at least, incomplete. First, doesn’t this seem pretty harsh of God? Adam and Eve make one mistake and they’re kicked out of Eden? How are we to respond to such a God? What are the implications of worshiping a God who offers not three strikes, but one strike, and you are out, punished, forever, Paradise Lost… and not just Adam and Eve, but every single human being that would come after them. Does a God with a zero-tolerance policy inspire us to love God, love neighbor, and love ourselves, to drop our nets like those early fishermen and follow Jesus? Maybe… if we’re afraid of what God will do to us if we don’t… and that view of God is definitely out there. Some of us grew up in “golden ticket” congregations, where you believed a certain way to get your ticket to heaven because to believe otherwise resulted in God’s punishment and condemnation… but a “because I said so” God is an inadequate view of God. This expulsion from Eden for taking a bite of a piece of fruit seems very harsh to me, especially since this is the same God who will lead a grumbling people out of slavery, who will someday die on the cross out of non-violent love for humanity, who will say “forgive them, for they do not know what they are doing.” Forgive them, God, for actions that are a whole lot more grave than taking a bite of fruit. Where is the grace in a zero-tolerance God? But there’s another issue with this story. Does this not seem like a setup? Why would God create a tree that God didn’t want anyone to eat from? Why would God set up this test? Well, yes. Except I wonder how much freedom Adam and Eve had in that garden to choose right and wrong. If Adam and Eve did not have knowledge of good and evil, until they had eaten from the tree of the knowledge of good and evil, how were they in any way equipped to evaluate the merits of their actions? Punishing Adam and Eve for this would be like punishing a llama for not being able to do calculus. And that right there is the sticking point for many folks. The Jewish writer and theologian Harold Kushner has written about this story not as a fall story, not as an example of Paradise Lost, but Paradise Outgrown. He points to the story as an example of the ways we as humans are always seeking after greater knowledge and experience—for good and for ill. In the musical Children of Eden, the characters of Adam and Eve begin to get, well, a little bit bored by the perfect predictability of life in the garden. In this interpretation, Eve (and then Adam) are restless in Eden, where everything is perfect, everything is provided… so they eat the fruit in a search for wisdom. This is our story, is it not? It is human nature to grasp for what we don’t have. Not content with things as they are, we strive, we question, we experiment, we grow. This can happen in healthy ways (children maturing and leaving the homes they grew up in) and unhealthy ones (people who cheat on spouses because they think something better is out there). One thing is certain, however—once that quest for knowledge, wisdom or experience has begun, life can never go back to the way it was. Adam and Eve never return to Eden. Children “can’t go home again”—things aren’t ever quite the same. And destructive deeds between spouses may be forgiven, but they cannot be undone. In Lois Lowry’s young adult novel The Giver, Jonah is an eleven-year-old boy who lives with his family in a strange society in which everything is carefully controlled. All decisions are made by the benevolent elders of the community: whom people will marry, what jobs they will have. Even clothing and hairstyle are regulated. Strong emotions or outbursts that would be disruptive to the community are discouraged. Every aspect of life is designed to maximize harmony and the orderly functioning of the community. It’s all perfect, in its own way. Jonah is given a unique job in the community: he becomes the Receiver of Memory. His role is to keep all of the knowledge of what has gone before, in case the elders ever need to consult that wealth of wisdom for advice. Jonah’s like a human library; he becomes the container for every piece of history, every emotion and human event. Through a series of meetings with the outgoing Receiver (now called the Giver), he learns and experiences things he’s never understood before, everything from snow to sunburn, from Christmas to a broken leg. He comes to realize how narrow the life of the community truly is. They do not know the joy of zooming down a hill on a sled… but nor do they know the horror of war. They don’t know good or evil. He alone does. And it is a terrible burden. It is a terrible burden, to have all this knowledge. I have always pictured Adam and Eve’s experience of good and evil with a similar cinematic flair: they eat the fruit, and in an instant this knowledge comes to them in a series of powerful images flashing through their minds’ eye. The glow of family flashes to the devastation of brother killing brother. The exquisite beauty of creation is drowned in flood. They see the totality of human experience laid before them and are stripped naked by it, vulnerable in a way they never were before. And once they have gone down this path, things are never the same again. Both these stories of Adam and Eve and of Jonah present a profound loss of innocence. And yet, Jonah realizes that his life before receiving memories was not much of a life at all. His was a world with no depth. His process is not unlike that described by Paul in I Corinthians 13, who “thought like a child, spoke like a child, reasoned like a child,” and put away those things when he became an adult. We might think of Adam and Eve’s story in a similar way. Without the knowledge of good and evil, what are we? We are just like any other animal who walks, runs, gallops, creeps, soars on the earth. Knowledge of good and evil is what makes us human. And it is what makes us… like God. The word “like” is very important! We are not God. But we are like God. Psalm 8 says that we are but a little lower than the angels. And that means we have an incredible responsibility. At the center of who we are as human beings is the knowledge of good and evil. No, we don’t know it perfectly, we probably don’t even know it that well most of the time. But our life is one of knowing good and evil… and perpetrating good, and evil. And we know the horrors of war. We know there are places where women are beaten, and burned, we know there are governments who torture, places where children are forced to become child soldiers. And we know of lands where people strap explosives to themselves and walk into open air markets. Oh, we know good and evil. We sit with the newspaper or in front of the TV news and we eat that fruit every day. At the end of the story, God kicks Adam and Eve from the garden, and stations an angel to stand guard so Adam and Eve don’t return. But why does God do that? Just to keep us from the good stuff? Because God is a punishing, wrathful God? Because humanity doesn’t deserve Eden anymore? And I can’t let that happen. We are kept out of Eden, apparently, so that we will not eat of that tree of life. So that our lives will be finite. Think about this. Think about what it means for Adam and Eve to know good and evil. The images of good are all fine and dandy, but those experiences of evil will be with them forever… Every bit of pain in the world, every act of violence, every horror of war, every cruel word, will be theirs to behold for all eternity. When my great-grandmother reached her 90th birthday, several of her friends and family said, “And you’re going strong! We’ll be back here in 10 years to celebrate 100!” And she got very quiet and serious and said, “No… I haven’t decided whether I’m going to do that yet.” Here is a woman who lived through the 20th century and all its beauty and all its horror, a woman who outlived children and grandchildren, saying, It’s been a full life—beautiful and hard. And knowing that the burden will be lifted soon is a beautiful thing. And a relief. Maybe God’s not punishing them by keeping Adam and Eve from the tree of life. Maybe it’s a mercy, not to live forever with the knowledge of good and evil! And so how do we sort through the various interpretations of this story? Well, the original sin stuff got attached to this story because for many years—centuries really—theologians fixed on pride as the fundamental human flaw. Adam and Even flouted God’s commandment because they thought they knew better. We want to be our own gods. We think we know best for our lives. We don’t need God. We can forge our own path. I would suggest that for people who struggle with pride, the traditional interpretation has much to offer. For someone who suffers from this thinking, can you see how the traditional interpretation would actually do more damage to their sense of self? It also denigrates the God who created each of us in God’s image! And so, if you struggle with this sense of self-denial, maybe you are called to hear something new in this story—namely, that you have been created in the image of God, and that you have knowledge, wisdom, and experience, that are precious gifts from God, and are not to be denied, but are to be celebrated and shared. And so, depending on where you fall on that spectrum, this story might nourish you differently. It is up to each of us, when confronted with a story containing complex meanings, to search our hearts, to pray for guidance, and to wrestle, confident that in that wrestling there can be a blessing. This sermon was inspired by Harold Kushner’s How Good Do We Have to Be? I'm putting together the Christmas Eve Lessons and Carols service at Tiny Church. Most of the readings will be straightforward, but I'm working with a couple of readers on some choral readings of the scripture. I wrote these a few years ago... THIRD LESSON Isaiah 11:1-9 Voice 1: A shoot shall come out! Voice 2: A shoot! Voice 3: A shoot! Voice 1: A shoot shall come out! Voice 2: A shoot!… Voice 3: …shall come out! Voice 1&2: of the stump of Jesse! Voice 3: A branch shall grow out of his roots. Voice 1: The spirit of the Lord shall rest on him, Voice 2: the spirit: Voice 1: of wisdom, understanding, Voice 3: of counsel, of might, Voice 2: of knowledge and fear of the Lord. Voice 1: His delight is in the fear of the Lord. Voice 3: He shall not judge by what the eyes see, Voice 2: or by what the ears hear; but with righteousness Voice 1: he shall judge the poor, Voice 3: the meek. Voice 2: The wolf shall live Voice 3: with the lamb. Voice 1: the leopard, Voice 2: the kid, Voice 3: the calf, Voice 1: the lion, Voice 2: the fatling, Voice 3: the cow, Voice 1: the bear, Voice 2: and the child, Voice 3: the child, Voice 1: the child shall lead them. Voice 2: They will not hurt, Voice 3: They will not destroy. Voice 1: And the earth will be full Voice 2: of the knowledge of God Voice 3: as waters cover the sea. Voice 2: Then Mary said, Voice 1: Then Joseph awoke… Voice 2: “Here am I, the servant of the Lord…” Voice 1: And he took her for his wife, Voice 2: “let it be with me according to your word.” Voice 1: And she bore a son, Voice 2: and he named him— Voice 1: Jesus. Voice 2: Now the birth of Jesus the Messiah took place in this way.